After Graceling, I couldn’t just skip the chance to read another Cashore book. So, I had a sample of Fire sent to my Kindle (because I’m learning to get free samples before dropping an hour’s worth of wages on something I’ll slog through). And you know what? I didn’t love it. Not because it was bad—because I was hung up on the characters from Graceling and didn’t care about the kingdom beyond the mountains. I couldn’t put it down. I looked forward to every quiet moment I had to sneak away and read it. I lost track of time more than once. It was dark. Emotional. Deep. Heartwrenching. Violent. Gruesome. Graphic. It was so complex and deep…I can’t explain it. For a young adult book, it was intense. It follows Bitterblue, the daughter of King Leck, a terrible man from Graceling who used his Grace to force people to do his bidding. He had a “thing” for little girls and animals—abusing them physically and sexually. Queen Bitterblue is in her twenties and at an age where she realizes that her advisers are ruling for her, she has no idea what is going on in her kingdom, and that she doesn’t really know what kind of ruler she is. 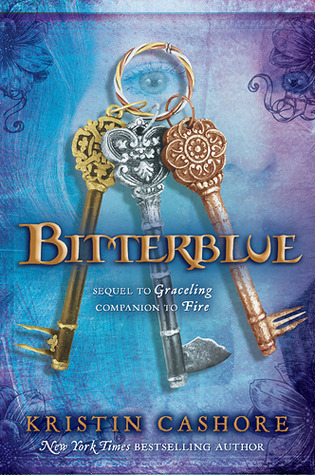 Throughout the entire book, I felt so, so connected to Bitterblue. I felt sick with her when she learned of her fathers heinous deeds, I felt her adrenaline when she slipped out at night to go to story houses, I felt the love she felt for her close friends and family, I felt her frustration at her advisers regarding her marriage. Because it’s a sequel, I won’t give anything else away. It was a beautifully written book and I hope Cashore writes more…I’ll definitely be picking Fire up soon. A 5/5 on Goodreads.